He may head Montana’s newest team but Griz softball coach Jamie Pinkerton is decidedly old-school in his approach to running his program, and that extends to handing out effusive praise about his players, which he tends to do sparingly in favor of focusing on the successes of the team. 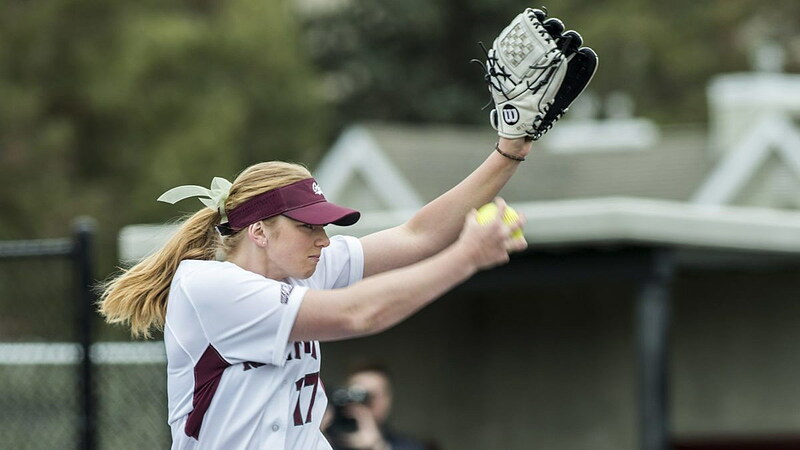 But he had no choice on Sunday, not after Michaela Hood set a program record with 12 strikeouts and pitched a complete-game three-hitter as Montana defeated North Dakota 2-0 at Grizzly Softball Field. “Today you could say she was spectacular,” said Pinkerton, whose freshman pitcher had strikeouts for all six outs in the first and second innings to get her rolling toward a dozen, which surpassed by one Kenzie Cole‘s program record of 11, also coming against North Dakota, in 2015. For North Dakota, Kaylin VanDomelen was nearly as good, if not as overpowering. She allowed just seven hits and actually dropped her Big Sky-leading ERA to 1.80 after giving up just one earned run. She was responsible for the unearned run, though, as Montana scored in the second to go up 1-0. After Sydney Stites, who would finish with her first three-hit game since Feb. 19, and Madison Saacke had back-to-back, one-out singles, Alex Wardlow grounded one back to VanDomelen that she fielded cleanly but threw over the first baseman’s head, allowing Stites to score from second. The Grizzlies scored again in the third. After Gabby Martinez opened the inning with a sharply hit ball up the middle and advanced to second on a groundout by Ashlyn Lyons, Bethany Olea singled up the middle. The second baseman got to the deep ball, though not early enough that a play could have been made on Olea at first. The ball was booted into short left field, and Martinez scored from third on the mishap to make it 2-0. That’s all Hood, who struck out at least one batter in six of the seven innings she worked, would need to win her seventh consecutive decision and improve to 8-2. She dropped her ERA to 2.38 as she pitched her seventh complete game, her second shutout. Hood, who walked two, allowed base runners in five of seven innings, and North Dakota moved them into scoring position in the second, third and fourth innings, but all the threats came up empty thanks to a pitching arsenal that was on full display. After Hood struck out the first two batters in the top of the fourth, including VanDomelen, who struck out three times in three at-bats, Alicia Young singled up the middle. Marina Marzolino followed with a chopper to third that Olea mishandled for just her fifth error of the season. The ball deflected to Delene Colburn at shortstop, and her rushed throw to first was offline, allowing Young to advance to third on a play that resulted in two errors for Montana. Hood was left facing Dani Romero with runners at the corners. “(Pitching coach Melanie Meuchel) does a good job of teaching that if you’re in trouble, don’t show it. Have poise and be calm and collected, and I think Michaela does a great job of that,” said Pinkerton. Hood got Romero to ground out to Olea at third base. Montana had just two hits in its final three innings at the plate, but with Hood in control, the Grizzlies didn’t need to generate any more offense. “Both pitchers were excellent today. They got into pitchers’ counts, and that’s why you have a game like this. It was a true pitchers’ duel, and we were fortunate to win,” said Pinkerton. With one weekend of league games in the book, Montana (17-17, 2-1 BSC) is tied atop the conference standings with Southern Utah and Idaho State, both of which also went 2-1 while opening at home, against Northern Colorado and Portland State. Montana will close out its 14-game home stand on Friday and Saturday with a three-game series against Southern Utah (6-17, 2-1 BSC), which scored 26 runs in three games against Northern Colorado. Friday’s doubleheader starts at 2:30 p.m., Saturday’s series finale at 1 p.m.